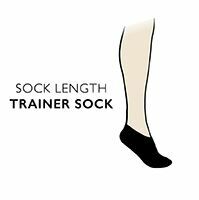 Keep comfortable and supported in the gym with these delicate, Cotton-rich trainer socks. Providing the freshness of sports socks without the bulk, these 2 pair pack of No-Show liners can be pulled on easily using the tab at the back. The terry cushioned sole protects you at every step. The high Cotton content keeps feet fresh and dry, no matter how hard you play. Hand linked toes for smooth seams eliminates the irritation that can be caused by toe seams.